INDIANAPOLIS – In the span of a single week, 84 young professionals in the Indianapolis area heard from two prominent business leaders in a banner week for Orr Fellowship. Founded in 2001, Orr Fellowship places graduates from typically Midwestern colleges and universities with host companies in Indianapolis to develop the next generation of business leaders and entrepreneurs. Candidates are evaluated on their academic success as well as involvement in the community and on campus. Once selected to Orr Fellowship, Fellows have access to professional development opportunities, networking with business leaders and peers, and career coaching and assessments through Orr’s curriculum. 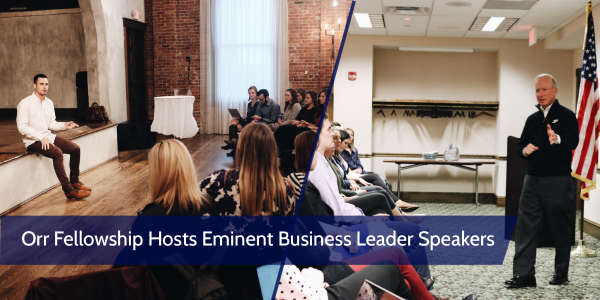 One featured aspect of that curriculum program is the Business Leader Speaker Series that highlights business leaders from in and around the Indianapolis area. Past speakers have included leaders from various walks of life and backgrounds: John Pistole (President of Anderson University and former Deputy Director of the FBI), Leonard Hoops (President & CEO of Visit Indy) and Aman Brar (President & CEO of Canvas). Fellows are given the chance to learn more about each speaker’s story, gain advice and insight, and ask questions. Last week, Orr hosted two prominent speakers in quick succession: Entrepreneur & reality television star Ben Higgins, and former Indiana governor & current Purdue University President, Mitch Daniels. Ben Higgins grew up in Warsaw, Indiana and studied Business Administration and Management at Indiana University, graduating in 2012. He worked as a Business Analyst at Talysis in Denver, Colorado before being selected as a contestant on the eleventh season of reality show The Bachelorette. After being eliminated, he was selected as the bachelor on the twentieth season of The Bachelor. In 2017, Higgins co-founded Generous International, a “for-profit for-purpose” enterprise that provides high-quality specialty coffee and uses the profits to invest in and support causes around the world. Higgins also serves as a board member on Humanity & Hope United Foundation, a non-profit that focuses on economic empowerment in Honduras. Higgins spoke on Monday, April 23 at the Neidhammer Events Center. Mitch Daniels studied public and international affairs at Princeton University and graduated in 1971. He earned his law degree from Georgetown University in 1979 and later worked for President Ronald Reagan’s administration as a senior advisor. Daniels served as CEO of Hudson Institute from 1987-1990 before accepting a role at Eli Lilly and Company, eventually becoming President of the company’s North American Pharmaceutical Operations. In 2001, he became Director of the Office of Management and Budget under President George W. Bush. Daniels was elected Governor of Indiana in 2004. At the conclusion of his second term as Governor in January 2013, Daniels became the 12th president of Purdue University – he continues to serve in that position today. Daniels addressed Fellows on Thursday, April 26 at Hussey-Mayfield Library. In a conversational presentation, Daniels shared the history of his close relationship with Orr Fellowship and his great support for what the program has done to keep talent in Indiana. “I’m tired of running into outstanding young people on their way out of the state because they didn’t see opportunities that matched their dreams….Orr Fellowship has always, to me, been emblematic of what we’re trying to do – both identify and try to connect potential leadership channels in this state,” said Daniels. He fielded questions on topics ranging from ways Indiana can continue to attract top talent and how the education system serves that mission, to personal career advice and learnings from his extensive experience. Daniels shared his joy that Orr Fellows are having and will continue to have a positive impact on the state, and left them with the advice to use their own successes to create opportunities for others in Indiana, as well as to never stop learning and improving. Learn more about Orr Fellowship at orrfellowship.org.